Summer weddings give you great weather and clear skies, but they also present a few challenges. The higher temperatures make it harder to wear many weddings dresses, even if the wedding is inside. 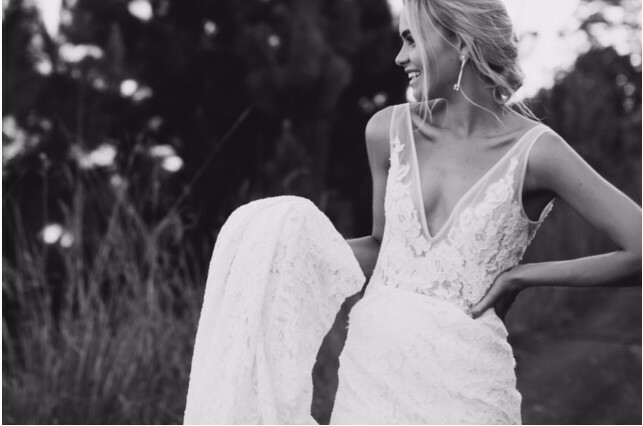 Finding the right dress might seem difficult, but there are a few tips to help you regulate temperature while still having a beautiful wedding dress. A professional can help you find the perfect designer wedding dress in Columbus. When choosing a designer wedding dress, you want to make sure you’re covered up enough so that you don’t burn. Yet at the same time, you need to use the right materials to stay cool. When it comes to material, silk and other natural and thin fabrics are your best friend. They look amazing, regulate temperature, and are very popular with designers. Lace wedding gowns are ideal for covering up shoulders and your back, and lace can be used to create intricate designs. While some lace wedding gowns are very heavy, it’s easy to find a light lace that looks elegant and provides protection. A long fishtail at the end of your dress is dreamy and iconic, but it’s not always the best idea. While it may not look like it would affect temperature, it actually creates a lot of heat near your legs. This is because it forces your legs together, and the extra material makes that section of the dress significantly thicker. If you must have one, ask to have the fishtail made thinner so that the effects are minimized. Getting a shorter wedding dress may seem completely out of the question, but there are many benefits, and they are becoming popular with brides. The most obvious benefit is that you’ll have airflow over your legs to minimize overheating. The dresses aren’t that short, so they still look very formal and elegant. Another benefit is not having to worry about grass stains.